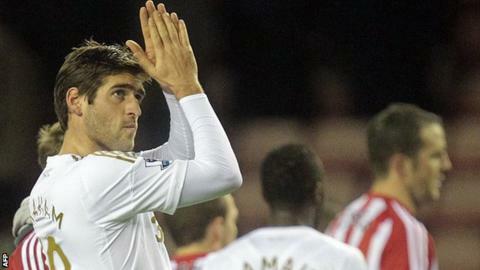 Michael Laudrup says Swansea have the squad to cope without Danny Graham, who has left to join Sunderland. Graham joined The Black Cats for £5m and Swansea failed in a bid to sign a replacement. But Laudrup believes it was the right decision to sell Graham. "It wasn't that Danny was unhappy but it was a combination of going elsewhere to play regularly, and especially the chance to go back home, which was his desire," he said. "I told him it was okay and I understood, but he had to understand there was the economic side. "Once the offer from Sunderland was good enough, Swansea as a club were happy and that combination made it clear it was a decision we had to leave him go." Graham had scored seven goals for the Swans this season but had found first-team chances limited following the arrival of Michu last summer. With the former Watford player departed, Swansea only have Itay Shechter and Luke Moore as back up and the pair have managed just two goals between them this season. Graham's £5m move to Sunderland was confirmed at lunchtime on Thursday, leaving Swansea just nine hours to find a replacement. Two potential late loan deals, understood to be for QPR's Jamie Mackie and Sevilla's Spanish international Manu del Moral, fell through. "It gave us a problem because we did not want to buy anyone so we were only looking at loans," he said. "We tried a couple of things. One of them was quite advanced and suddenly the president of the other club changed the rules and it wasn't possible to have a loan, only a permanent deal. "You can always press the panic button just to bring someone in, but I don't think that was the case here. "I still believe I have options in the squad. Danny is a good player, but remember he was not playing regularly. "I still think inside the team, even with injuries, we have possibilities to have quite a competitive team. "We have scored more goals than last season, we have others who have scored goals. "You can never argue about numbers but we still have our top scorer. We have not sold Michu, we have sold a player who was on the bench. "The other strikers haven't scored much but our midfielders and wide players have. "If we had 20 points instead of 34, or had only scored 20 goals, maybe you would have seen two new centre-forwards here. But you have to analyse the team and the situation you are in."